This week’s title should really be “Where There Isn’t a Will.” That’s because sometimes a probate case, when a person dies intestate, can tell you more about that person than a will ever could. When I started writing the California gold rush story about my ancestor, Henry Zane Jenkins, I turned to a collection of family letters which had been sitting in my files for literally decades. Henry’s writing is tedious to read, but I realized that there was a story buried in there. First, I scoured the letters to gather the names of people he referred to, particularly the men who went with him from Indiana to the mines. There was a group of ten all together. 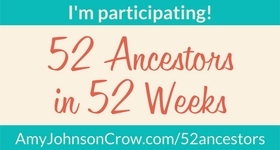 Aside from Henry (3rd great-grandfather), two were uncles of mine and one was a cousin, though I didn’t realize all that at first. I painstakingly found records and pieced together the lives of each. One of the men, Asa Harvey Hunt, was the first to return from California. He was apparently in ill health, as he died on Christmas Eve 1852, about six months after he got home to his wife and five children. “Poor Hunt died the day before Christmas left a helpless family they say they moved to Camden a short time before his death.” – Abigail Jenkins in a letter to her husband, Henry Zane Jenkins, in California, January 10, 1853. Though Harvey went west to make a “pile” of gold, like most, he did not succeed. What I didn’t realize, until I found his 122-page (!!) probate record on Ancestry, was that Harvey was already in deep debt before he left home in 1851. Toward the end of the record, I found a document that rocked me on my heels: a promissory note for $2,800, signed by five of the men in the mining company, plus many other men from the community. Whoa! That’s a lot of money for 1851. When you consider that Harvey was taken to court for $20 debts, that large note does seem astronomical. That discovery eventually led to a much deeper understanding about what these men did in order to finance their gold mining expedition. I wrote about that earlier (here). Also in the probate, I found that there had been court judgments for Harvey’s debts even before he left. There were also records for purchases he made on account in the time between when he got home from California and the time he died. Many were for cloth and shoes – his family was likely dressed in rags by the time he came home. Not surprisingly, Harvey’s widow soon remarried. His estate took over a decade to settle, because his assets were nowhere near enough to cover his debts. It’s just one sad aspect to the whole gold rush story. Feature image: A bill for new and repaired shoes presented to the estate of Harvey Hunt. The purchases were made before Harvey died in 1852, but not presented to the estate until 1857. Headstone of Asa Harvey Hunt in Hillside Cemetery, Pennville, IN. (E. Lyon 2017). Pennville was previously known as Camden.